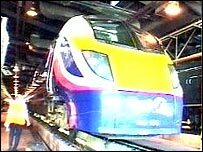 First Great Western rail passengers from Devon and Cornwall will be able to arrive in London by nine o'clock in the morning for the first time. The new high speed Adelante train travels at 125 miles per hour and will begin service at the end of the year. Its greater power to weight ratio means it is suited to maintaining high speeds up gradients, say officials. Railway staff at the company's Laira depot in Plymouth, are learning how to maintain the train. First Great Western spokesman Rigby Mason says the train incorporates the latest in rail technology. He said: "The beauty of it is for the first time we'll be able to offer First Great Western customers the chance to get to London by nine o'clock in the morning." The new Adelante train has a number of additional features for people with disabilities, including braille signs and call-for-help buttons next to priority seating. The company says the new timetable will start in December.